May 4, 2017  Stephen Colbert had some choice words for the president on Monday's Late Show. 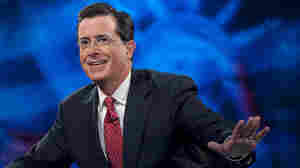 Despite calls from some for a boycott, Colbert said Wednesday, "I would do it again, [but] I would change a few words." 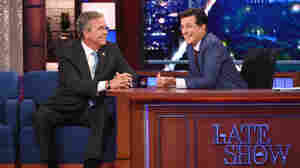 September 9, 2015  The opening Late Show with Stephen Colbert was so packed with business, guests and music, it went several minutes overtime. 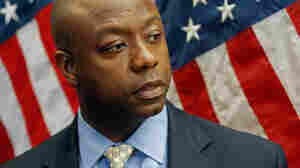 But TV critic David Bianculli says "it didn't feel long. It felt good." September 9, 2015  The GOP candidate was friendly and warm, but he wasn't energizing, or even the center of attention. 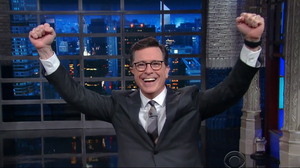 At one point Colbert riffed: "Oh, you were so close to getting [the audience] to clap!" August 7, 2015  How do you say goodbye to TV's smartest satirist, especially when he seems determined not to get too sentimental? You invite everyone who's ever been a correspondent, and a surprise guest or two. 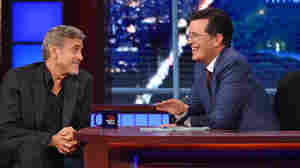 December 18, 2014  Both Stephen Colbert and Craig Ferguson end their late-night TV shows this week. 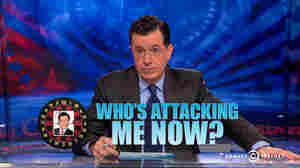 Colbert is getting a boatload of attention as he moves to succeed David Letterman, but Ferguson deserves some too. 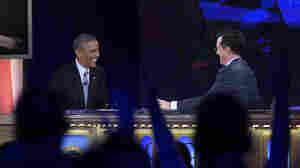 December 9, 2014  President Obama briefly hosted comedian Stephen Colbert's show Monday, declaring, "How hard can this be?" June 6, 2014  Also: Ruth Graham says adults should be "embarrassed" to read YA novels; a judge ends Harper Lee's lawsuit against hometown museum. May 19, 2014  The world's failure to come to terms with global warming is also the source of some very funny comedy, says Commentator Tania Lombrozo. April 10, 2014  The Comedy Central star will sit behind the desk after David Letterman retires next year, CBS announced Thursday. 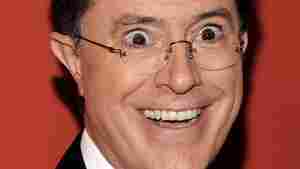 April 1, 2014  In his first show since a controversy erupted last week, Stephen Colbert poked fun at the media and himself, declaring that despite a #CancelColbert campaign on Twitter, "I'm still here." November 22, 2013  Google and Warner Bros. have teamed up to create an interactive experience. 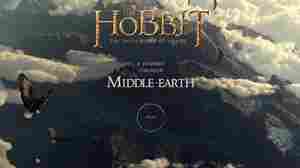 It's been launched in advance of The Hobbit: The Desolation of Smaug, part two of director Peter Jackson's movie trilogy based on J.R.R. Tolkien's book. 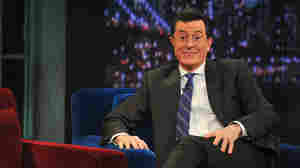 June 20, 2013  Colbert dedicated the first four minutes of his show to honor his late mother, Lorna Colbert.